Hello all! Well, we survived another week without alien invasion or Godzilla attack. I think we should all count that as a success. Just a quick reminder. I do have a contest going on that will not only garner a winner a signed copy of "Life is a Circus Run by a Platypus," but the winner will also have their own writing talents showcased in my next book. All you have to do to enter is complete the statement, "Going through airport security is like..." in either the comments below or on any of the Facebook posts about it. I've already gotten some awesome entries, but keep them coming people! 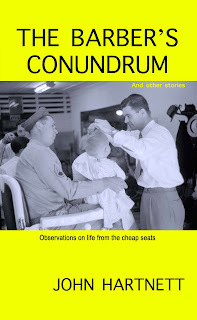 Author John Hartnett captures a wonderful slice of family life in his book "The Barber's Conundrum." Vacillating between commentary on parenting, lampooning magazines and televised news and providing snarky tips for restaurant owners, this collection of essays and anecdotes will leave you smiling. Hartnett's writing is easy to relate to and great for either short reading spurts or a longer time spent curled up in a cozy chair. What is even better is that I was able to snag an interview with author John Hartnett! Do you mean besides having an excuse not to fold laundry? I've always had a love of writing, books, movies and art and even before putting pen to paper, I was always "writing" jokes and playing with words in my head to use in everyday conversation. I knew from an early age that I wanted to be a comedy writer and that was the impetus to start. Regardless of how many books I sell or how many people read my work, mentally and emotionally, I need a creative outlet in order to feel fulfilled. It's a big reason why I started my humor blog, The Monkey Bellhop. I try to post new material there at least three or four days a week. Also, writing makes it easier to justify not working out. I run hot and cold with exercise. Right now, my body is telling me it has hypothermia. If you could rewrite any book or movie as a musical, which one would it be and why? Great question. 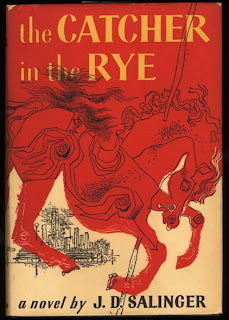 I think I would take a crack at turning "The Catcher in the Rye" into a musical because the day it opened, I would go to the cemetery where J.D. Salinger is buried so I could find out once and for all whether people really can turn over in their graves. What was your favorite part about writing "The Barber's Conundrum?" Finishing it! I did everything myself including copy editing, layout, cover design, etc. It wasn't because I thought I was the most qualified person for the job, I'm just notoriously cheap. In retrospect, I don't recommend being your own editor or cover designer, unless you have real skills there, and hope I don't have to do it again. I did feel a great sense of accomplishment in putting it all together but the best part overall has been the initial reaction to the stories which were very positive and encouraging. The reviews on Amazon have helped me to have faith that there is an audience for my book. I made a decision very early in the writing process not to use any profanity or to write about anything overly offensive since there's already a lot of that material out there. I'm not a prude or anything, it was just a choice I made about my work. I think that as a result, the appeal has broadened a bit to a much wider demographic than I had initially envisioned. I have had parents tell me that their kids got a kick out of the school stories like The School Project: An American Tragedy, Making Homework History and The Only Child Rearing Book You'll Ever Need. Your book is in the running for the Amazon Best Indie Book Awards, how excited are you for that? I'm very excited. As an independent self-published author among a virtual sea of independent self published authors, I'm honored and more than slightly amazed to be recognized at all. I try to do as much outreach as I can to promote my book, as all independents have to, but there are days where you feel the odds of anyone "finding" your book are greater than discovering a message in a bottle in the middle of the Atlantic that contains all 5 winning Powerball numbers. I tell people that marketing a self published book is akin to a salmon run made all the more difficult because the salmon representing your book is also deceased. If you had to choose between eating nothing but custard pie for the rest of your life or being stuck in a room with a very annoyed gorilla for a day, which would you choose? I would probably go with the gorilla as long as he is not a term life insurance salesman. Or a trained custard pie chef. You didn't clarify, so unless that's the case, I'll go with the gorilla. One thing I don't need is one of those O Henry like twists to mark the end of my days on Earth. I want something fast and easy. My goal is to just find myself in Heaven and the first words that come out of my mouth are, "What hit me?" Thank you John! 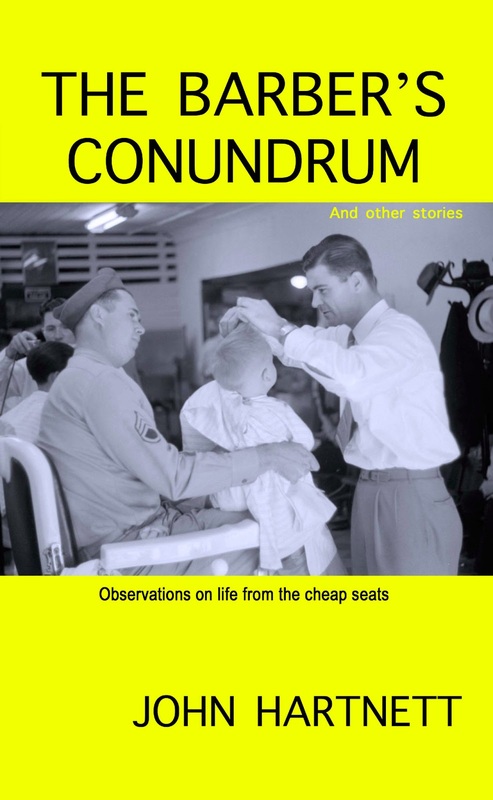 For those interested in picking yourself up a copy of "The Barber's Conundrum" you can do so via Earlybird Press, Amazon, Smashwords and Barnes and Noble. 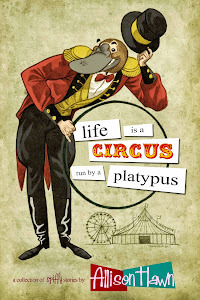 "Life is a Circus Run by a Platypus" is getting some awesome reviews! Amazon reader FromtheAshes says: "Allison's talent at seeing the random and hilarious side of every situation provides the reader with sore sides and a refreshed mind. This book is perfect for those moments when you're looking for a short, but light-hearted, read. The stories are entertaining and the lessons at the end of each are sure to amuse and make you nod your head in agreement. I look forward to reading more from Allison!" Thank you again to all the readers who write reviews, as a first time author they make a huge impact! As always, feel free to follow my daily adventures on Facebook, Goodreads and Twitter! Enjoyed reading about John, he is so funny he is almost a miracle! One of the most original satirists, his humour is sparkling and long lasting while never sounding contrived. I am not surprised he is doing exceedingly well at the Amazon charts. Wish him the best for Amazon Best Indie Book Awards.